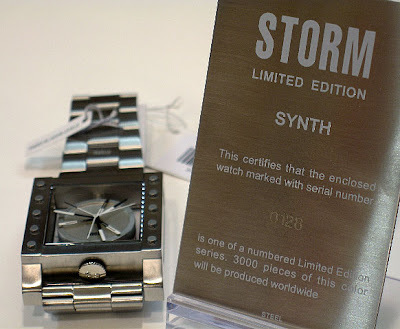 This latest Limited Edition Storm Synth watches camouflage the correct time within a busy nine-haded display. Once you get past the apparent chaos, you see the hours, minutes and seconds with complete clarity. It's the Where's Waldo of wristwatches. 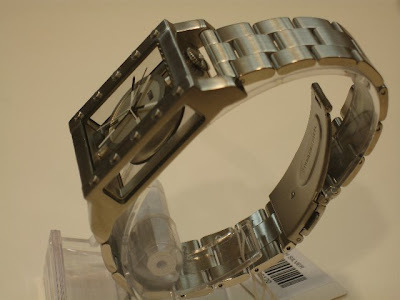 Outside of that, (actually, inside of that) the watch itself is held in suspension within the massive 51mm long stainless steel case and shown from crystals on both the front, back and sides of the watch. Antiquorum’s summer sale of “ Important Collectors’ Wristwatches Pocket Watch & Clocks” on June 11th auction will include timepieces from twentieth century icons President Franklin Delano Roosevelt, Frank Sinatra, Sammy Davis Jr and Steve McQueen in addition to an exceptional selection of wristwatches from every major brand. The auction will be held at Antiquorum’s US headquarters on Madison Avenue. Clients will have the opportunity to view these exquisite, and in some cases unique, timepieces all over the world including Tokyo, Bangkok, Hong Kong, Los Angeles and New York. The 14K gold Movado watch retailed by Tiffany and Co. that was given to President Roosevelt on the occasion of his 63rd and last birthday by his son-in-law, Col. John Boettiger on January 30, 1945 will most certainly be of interest to FDR fans and Movado aficionados alike. This timepiece is a unique and historically important Movado Ref. 44776 with triple date calendar, produced in 1944 accompanied by correspondence authenticating FDR’s memorabilia. President Roosevelt, known as FDR, was the celebrated 32nd President of the US and the only President in US history to serve four terms (1933-1945). Recognized as one of the greatest American Presidents of all time, his Presidency spanned the Depression of the 1930’s and World War II. The watch was worn by FDR during the last two months of his life, including perhaps to the Yalta Conference in February, 1945 and he may have been wearing this watch when he died on April 12, 1945 at Warm Springs, Georgia. In 2008, the Movado-Tiffany watch was part of a Presidential display for the National Association of Watch & Clock Collectors timepiece collection. Antiquorum experts estimate this fine and historically important timepiece at $ 50,000 - $ 60,000. Fans of the legendary actor, Steve McQueen and race car enthusiasts will also be very interested in the upcoming June sale as it will include the iconic Heuer “Monaco” wristwatch previously owned by Steve McQueen and worn by him during the filming of the 1971 movie “Le Mans”. Steve presented the watch to his financial advisor upon his return home from filming in appreciation for financially restructuring both himself personally and his company, Solar Productions Inc. The Monaco watch was originally launched by Heuer in 1969 in honor of the Monaco Grand Prix. The watch is a fine and unusual, square convex, water-resistant, stainless steel self-winding wristwatch with chronograph and date. Antiquorum Experts have placed a pre-sale estimate of $ 10,000 - $ 20,000. View the entire Antiquorum Catalog for this auction. 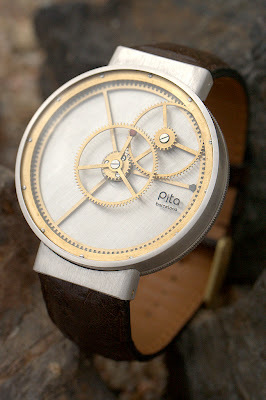 I'm already a fan of Pita's undeniably original and minimal one-handed and carousel automatic ball-bearing movement watches. See the rest of his collection here. No hands timepiece. Floating hour and minute wheels telling directly the time, without hands. Wheels and cannon pinion elegantly maximized with embedded precious stones (laquered finish in shown prototype) to indicate the time, in an unprecedented and ethereal manner. Symmetric case, no crown. 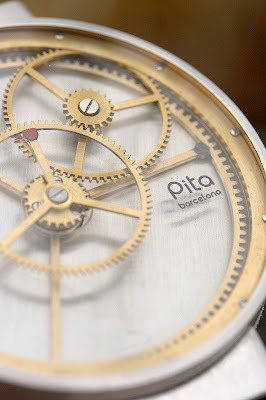 Pita-005 movement featuring patented Pita-TSM System (Time Setting Mechanism), replacing remontoire and winding systems developed by Pita. 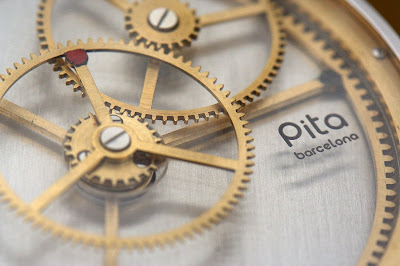 Designed and handmade in Barcelona Spain. Short and numbered series. 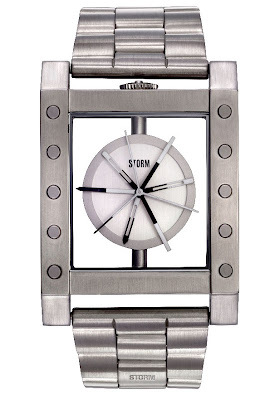 Dimensions: 42mm, height 9,4mm. Strap 20mm. Time in Six Parts is a series of attempts to unravel and re-present time through alternative perspectives. The hope is to demystify scales of time that are out of our immediate reach and explore new approaches to marking time. 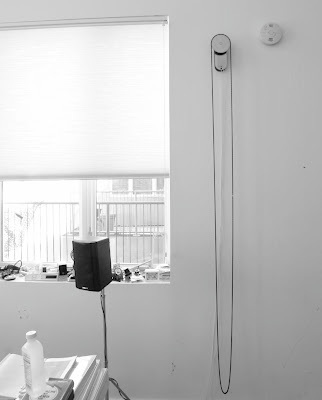 Six timekeeping devices were built as part of Che-Wei Wang's thesis project at the Interactive Telecommunications Program at TISCH, NYU. 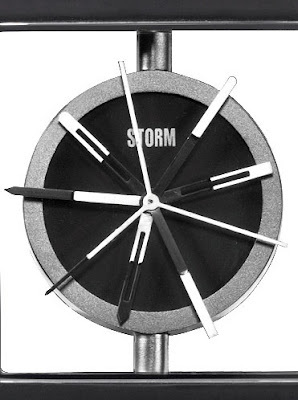 How accurate does a clock need to be? 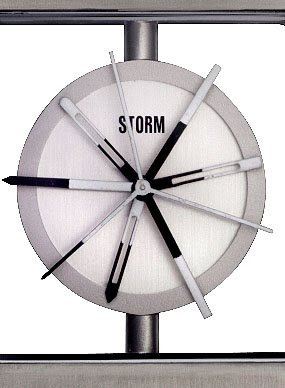 Most household clocks display time with 3 mechanical movements; the hour, on a 12 hour cycle; minutes past the hour; and seconds past the minute. How crucial is it for us to know how many seconds are past the minute? Do we need to know the exact number of minutes past the hour? 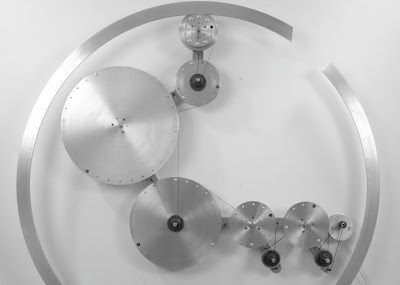 One Hour Sprocket is a wall-mounted 12 hour clock with a 60 tooth sprocket attached to a motor, completing one revolution every hour. From the sprocket hangs a chain that consists of 720 links. Each link accounts for every minute of a 12 hour cycle. 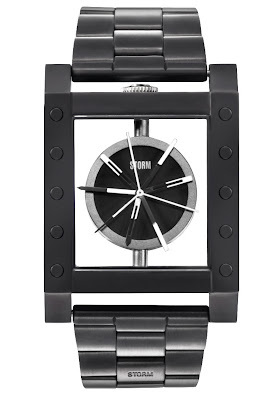 Among the black chain links is one polished stainless steel link to identify the position of the hour past 12 o’clock. To tell time one can estimate the position of the “hour hand” or count the number of links from the polished link to the top of the clock for a more accurate reading. Between two 1/4” steel plates, sits a stepper motor, which ticks every 18 seconds. 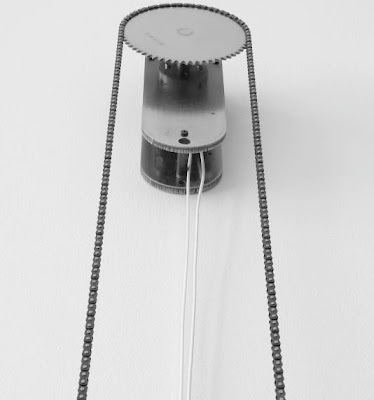 The hanging chain juggles with each tick reassuring the clock’s functionality. Counting to a Billion is a device created to fulfill the desire to count. 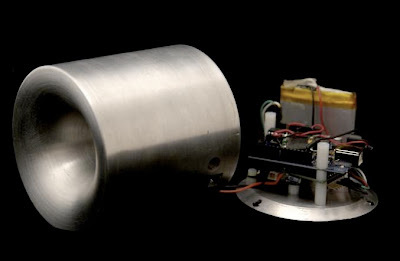 The electronics consists of a microcontroller, a speech module, and a speaker powered by a rechargeable battery. There is no/off switch. The voice begins counting at one, two, three and continues counting up until it reaches one billion at which point in time it will stop. Time is our measure of a constant beat. We use seconds, minutes, hours, days, weeks, months, years, decades, centuries, etc. But what if we measured time against rituals, chores, tasks, stories, and narratives? How can we use our memory, prediction, familiar and unfamiliar narratives to tell time? As a child, I remember using the length of songs as a way to measure how much time was left during a trip. A song was an appropriate period to easily multiply to get a grasp of any larger measure like the time left until we arrived to our grandmother’s place. The length of a song was also a measure I could digest and understand in an instant. 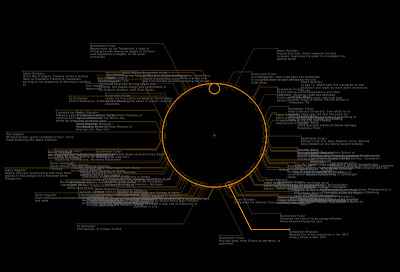 The first iteration of Cinematic Timepiece consists of 5 video loops playing at 5 different speeds on a single screen. The video is of a person coloring in a large circle on a wall. 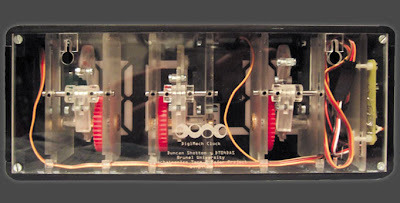 The frame furthest to the right is a video loop that completes a cycle in one minute. The video to the left of the minute loop completes its cycle in one hour. The next completes in a day, then a month, then a year. Through various iterations, we intend to experiment with various narratives and rituals captured in a video loop to be read as measures of time. The software was written in OpenFrameworks for a single screen to be expanded in the future for multiple screens as a piece of hardware. click image to view "In A Lifetime"
The website collects information about each individual through a publicly accessible interface. Input parameters are, author, date of birth, lifespan, milestone or note, and significance (0-100). Anyone who visits the site can enter information about an individual to be mapped. If one so desires, you can enter your predicted lifespan to compare personal milestones to others. Often, it is a new face that ushers in new times. 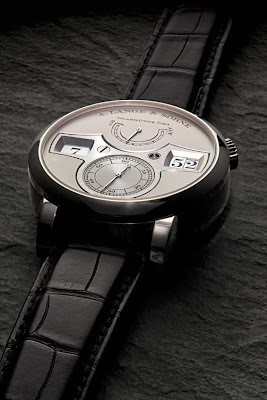 That was the case after the rift in Europe had healed and the LANGE 1 paved the way for the comeback of A. Lange & Söhne. Fifteen years ago, it enriched the realm of horology with a fundamentally new concept and unprecedented technical finesse. As a design icon, it has long conquered its place at the pinnacle of timelessness. 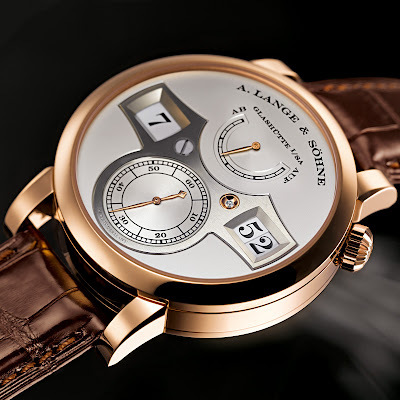 Now, with a mechanical, precisely jumping hour and minute indication of singular clarity, Lange presents another milestone. So yet again, a new face ushers in the next era in timekeeping. Its name: Lange Zeitwerk. 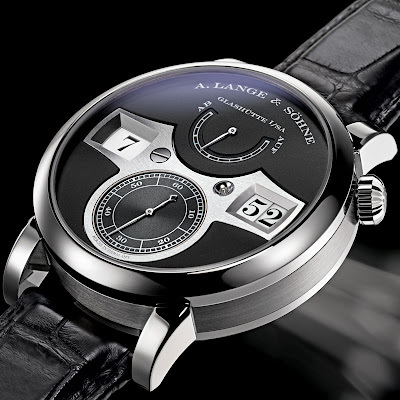 With its emblematic name, the Lange Zeitwerk is a watch that stands for uncompromising clarity. 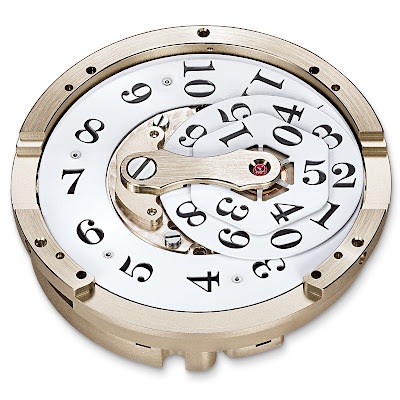 Thanks to the unparalleled size of its numerals, it tells the current time at even a cursory glance. 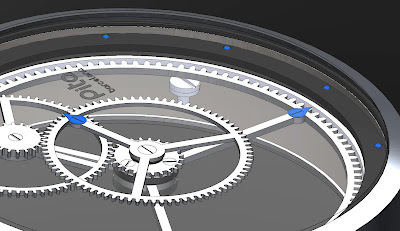 With a whispered click and within fractions of a second, the minute display advances step by step until the watch initiates the big jump at the top of the hour. At this point, all three numeral discs switch forward simultaneously and instantaneously by exactly one unit. Here, timekeeping is elevated to the status of an event. The perfect moment for the showdown is at 11:59 – “high noon” in a widescreen format. The seconds hand embarks on its leisurely trajectory along the periphery of the subsidiary dial. Time seems to slow down as its course is deliberately observed. Thirty seconds to go. Mounting suspense. Then: ten… three, two, one – click – 12:00. One small step for a watch, but a giant leap for horology. Beneath the extraordinary face, an equally revolutionary movement with a diameter of 33.6 millimeters fully occupies the space inside the 41.9-millimeter gold or platinum case. 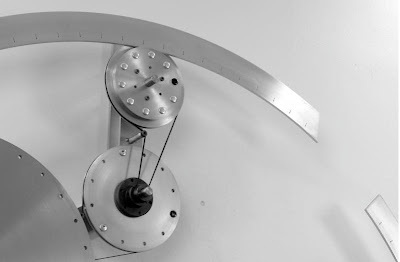 The significant amount of energy required to simultaneously advance all three numeral discs once every hour is delivered by a newly developed barrel with an extra-strong mainspring. 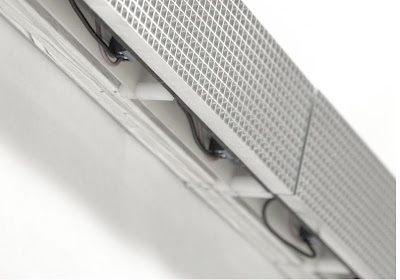 Its patented design literally turns the venerable wind/unwind principle upside down. Thus, the mainspring barrel bearing with the higher friction rating is involved when the watch is being wound, but the barrel wheel always turns in the minimized-friction bearing as the mainspring gradually relaxes. 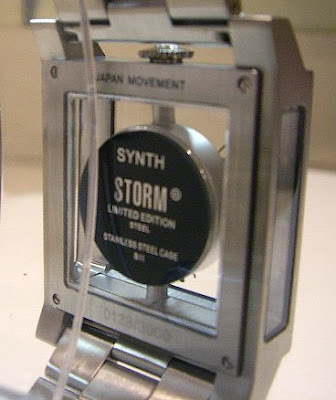 This makes more torque available for powering the watch as well as the ensemble of discs with the hour and minute numerals. 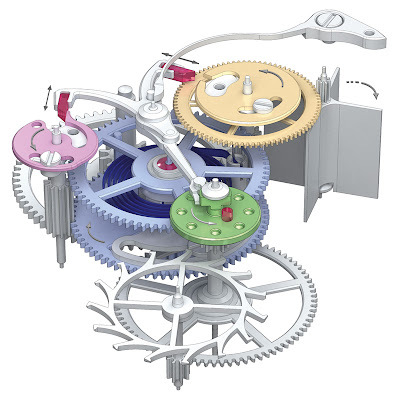 At the same time, the constant-force escapement makes an important contribution to stabilizing the rate of the movement: across the entire 36-hour autonomy period, it drives the balance with nearly uniform power, regardless of the state of wind of the mainspring and unaffected by the energy-consuming switching cycles that take place in one-minute intervals. 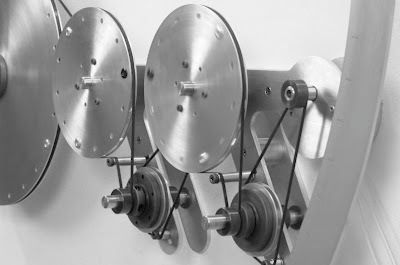 Incidentally, a balance wheel with eccentric poising weights and a hairspring manufactured in-house constitute the high-precision beat controller. 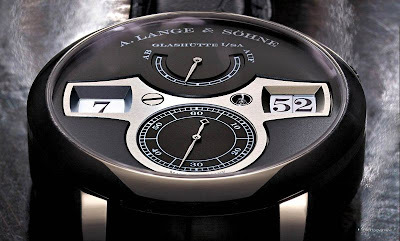 With its graceful appearance and intrinsic values, the Lange Zeitwerk is not only a seminal timepiece, it also makes a strong statement about the personality and the style of its owner. It delivers a new experience in time – whether with eyes wide open or shut. 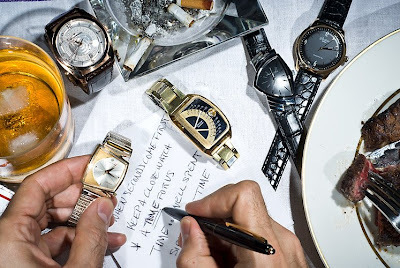 CREATIVE TICKS Clockwise from top left: Vacheron Constantin Quai de I’lle in rose gold, $31,500; Hamilton Ventura Chrono, $695; Glashütte Senator Sixties in rose gold, $12,800; 1968 Wittnauer Sector Futurama Double Retrograde with original box, $2,500 at watchismo.com; 1961 Hamilton Electric Vega, $2,800 at watchismo.com. OUR grasp of time is tenuous at best, from trying to really “get” relativity to fretting over those lost years when we never managed to write that novel. Is it any wonder we want time to comfort instead of alarm? Perhaps this explains the happy solace so many men find in the AMC drama “Mad Men,” that window into the crazily optimistic postwar world, when cigarettes, steak and three-martini lunches were the fuel an adman needed to dream up such sterling slogans as “It takes a licking and keeps on ticking” (coined for Timex in 1956). That spirit is there in the period’s watches, too. In the late ’50s, the playfulness at work in car and furniture design hit the gentlemanly watch world. In 1957, Hamilton introduced asymmetrical electric watches, and the line — especially the triangular Ventura — was an instant hit. Now, luckily for those of us who don’t smoke or get lit at lunch but who think of the “Mad Men” lifestyle with fondness, the look is a hit again. Crazily inventive ’60s timepieces are among the best sellers at watchismo.com, a vintage-watch site. And Hamilton’s president, Matthias Breschan, reports that the company’s new take on the Ventura is selling better than its most high-tech models. The look can also be found at the top of the Swiss-watch heap. Glashütte’s Senator Sixties model recalls President Kennedy’s stylish merger of stateliness and modernity. Vacheron Constantin’s latest release, the amazing Quai de I’lle, works a host of features, like a calendar dial, into a face worthy of Sean Connery’s James Bond. Even better, these clever watches betray their value to only the most discerning eye — no diamond bezels here. But say: maybe in 2059, those will make a comeback, too. 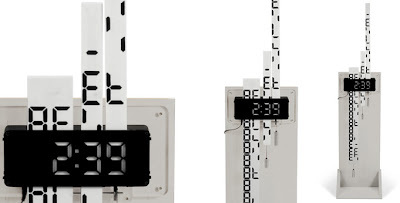 Young British designer Duncan Shotten has created this inventive mechanical digital prototype clock. For those of you that appreciate Harry Winston Opus 9 reinterpretation of a digital watch as a mechanical timepiece, then you gotta dig this kid's clock. Numbers are printed on vertical sliders and only reveal themselves when shifted into perfect alignment with the 'display box'. when not aligned they look like random, alien forms and represent the negative of the number that is required. To see it in action, view the video above.